RIO, 15 June 2012 — Momentum is building for this Monday’s 24-hour “Twitterstorm,” a massive international online action to increase pressure on world leaders to cut nearly $1 trillion in fossil fuel subsidies at the upcoming Rio+20 Earth Summit. 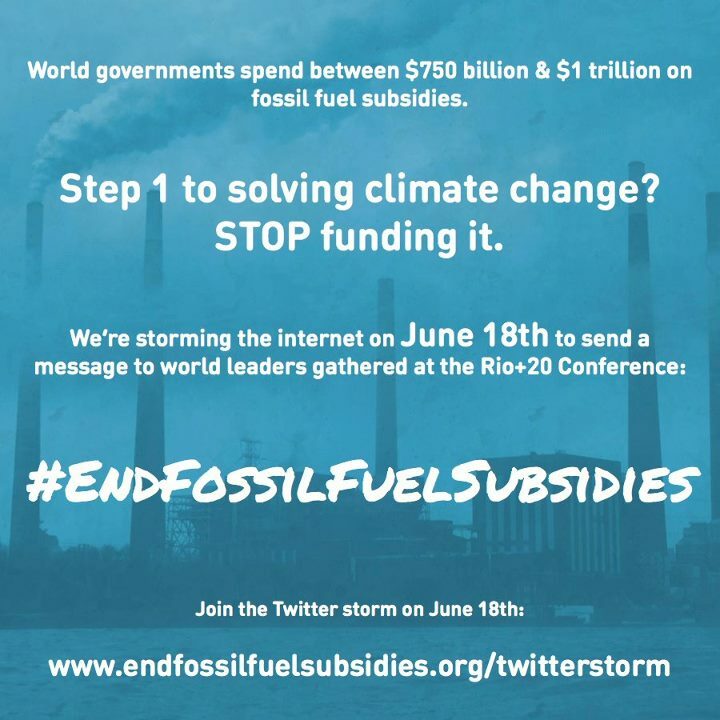 For 24 hours between June 18th and 19th, as world leaders gather at the G20 summit and prepare for Rio+20, hundreds of thousands of people around the world will tweet with the same hashtag — #EndFossilFuelSubsidies — at celebrities and politicians, flooding the popular social network with their demand. Over 1 million people have already signed a petition calling on leaders to act. WHEN: The 24-hour clock will begin at 8:00 UTC (6 PM local time in Sydney) when activists will flock to Twitter with messages that will be projected in iconic locations in Sydney, New Delhi, London, and Rio. In recent weeks campaigning groups have collected over 1 million signatures demanding that leaders act now. In May, leaders of the G20 again pledged to eliminate fossil fuel subsidies. They first made the commitment in 2009 but have yet to implement the policy change at the country level. While global warming emissions rise and gas prices spike, fossil fuel companies continue to make massive profits, which brings into doubt the need for subsidies. ExxonMobil, for example, made $41.1 billion USD in profit in 2011. Oakland, 7 June 2012 — Campaigning organizations from around the world will join forces on June 18 for a 24-hour ‘Twitter storm’ in which tens of thousands of messages will be posted on the social networking site demanding that world leaders use Rio+20 to agree to end fossil fuel subsidies. The 24 hour clock will start at 6PM local time in Sydney (8AM UTC), when activists will begin to flock to Twitter with messages that will also be projected in iconic spots in Sydney, New Delhi, London, Rio, and other locations. In recent weeks campaigning groups have collected over 1 million signatures demanding that leaders act now to end subsidies and start to invest in clean energy solutions. According to figures compiled by Oil Change International, countries together are spending as much as $1 trillion dollars annually on fossil fuel subsidies. The International Energy Agency estimates that by cutting these subsidies, the world can cut global warming causing emissions in half and significantly contribute to preventing a 2 degree temperature rise, the number most scientists say we need to stay under to prevent runaway climate change. “We are giving twelve times as much in subsidies to fossil fuels as we are providing to clean energy, like wind and solar. World leaders shouldn’t be subsidizing the destruction of our planet, especially since these subsidies are cooking our planet,” said Jake Schmidt, International Climate Policy Director at the Natural Resources Defense Council. While global warming emissions rise and gas prices spike, fossil fuel companies continue to make massive profits, which brings into doubt the need for subsidies. ExxonMobil, for example, paid an effective US federal tax rate in 2010 of 17.2 percent, while the average American paid 28 percent. Participating organizations include 350.org, Avaaz, Greenpeace. Oil Change International, Natural Resources Defense Council, and others.